Martin Günther from Switzerland sent me these photos last night of his Double Rainbow weathering a storm yesterday. Makes me really wonder what I can look forward to with my Rainbow. Martin’s DR failed at the crest of his ridge pole exactly where I predicted the tent was weak. Anyone else have this happen to them? “Wow!” is right! It’s the same reaction I had when I saw the photos. I agree that the Rainbow is a great moderate inclement weather tent. I used my Rainbow in the Japan Alps all summer, and it handled very well (except for not having seam sealed it and having to deal with all the seams leaking). I just never had to deal with wind of the sort Martin faced as in his photos. The length of the single pole inherently makes the Rainbow vulnerable to high wind stress, I think. More so than even the TarpTent Squall or Virga. Whereas the hiking poles used to support the other TarpTents are rigid, the Rainbow’s pole is flexible, so naturally it will contort with strong winds. I’m not pooh-poohing the Rainbow and Double Rainbow… I just think the information on what they can handle should be realistically presented so that people can decide whether it is the shelter they want to use for their particular outing. It’s no fun getting up to above treeline and then spending a night with this wildly shuttling shelter above them. Hi Henry. Good to hear from you again. Any good hikes this summer? One thing I did when I was in the Japan Alps this summer was to fit my single hiking pole up against the end of the cross strut pole, right at the apex of my Rainbow, by the entrance. You can see it here in the second photo. It really made a big difference in shoring up the tent laterally and I think that if you could provide grommets at both ends of strut pole, allowing you to use two hiking poles, as with your Squall 2 and Virga 2, the Rainbow and Double Rainbow could really handle some strong wind. The hiking pole on my configuration never got in the way and helped prevent the top of the ridge pole from swaying foreward and backward. The guyline loops that you installed, Henry, have been a lifesaver for stabilizing the tent longitudinally. Martin originally contacted me for more information about them. My two suggestions are that they be sewed with more reinforcement, and take advantage of the ridgepole itself in their function along the ridge seam, instead of simply being sewed to the outer ridge seam fabric. I would suggest a “U” formed single piece of grosgrain ribbon that runs around the pole and thereby pulls the pole itself when in tension. I’m still uncertain about whether the guylines that would run from these guyline loops should pull in a single line along the axis of the ridge pole (as I’ve done here), or to two sides, as a “V” configuration, that would stabilize the tent at four points rather than just two. I tried out the second configuration here at home and the tent holds well at those four points, but, like the first configuration, the top of the ridge pole still oscillates badly when pushed (which is what I think is happening in Martin’s photo). Martin did send me some other photos of several earlier trips he took with his Double Rainbow in the Swiss Alps this summer. In all those photos he had pitched the tent correctly, as per your instructions above, Henry. I think the “incorrect” pitch he resorted to in the photo above was in response to the high wind and trying to find a way to cope with the Rainbow’s bad handling of the wind. After all, you want some kind of battening down of the doorway, and with the big opening at the bottom, inevitably there is going to be a lot of “sailing” of the door flaps. I had the same trouble with my Rainbow this summer. The doors just didn’t handle wind very well. I guess in an above-treeline storm you want to get as much of the shelter fabric down to the ground as possible. Even Ryan lowers his tarps to cut their profile to the wind. I am a very happy owner of a Rainbow tarptent. If Henry can strengthen the tent’s wind resistance without adding weight or complications — fine, and more power to him. HOWEVER, I didn’t buy the very lightweight Rainbow to use in a totally exposed area somewhere in the Alps! I bought it for what it’s designed for: camping in temperate areas of low to moderate humidity! I have other (heavier) gear to use for harsher environments. Sure, one can add a few guy out tabs to strengthen/stabilize the tent in strong wind. But structure aside, when the wind is that strong, the draft inside is just going to be crazy! So now, we would want fabrics that reach further down to the ground. But this will likely result in more condensation inside the tent! So then, what? Hello Ben. I hear you. But isn’t this whole site about lightweight backpacking and learning what different gear and techniques can do? People are looking for the lightest weight shelters and trying to figure out how far they can go with what they decide to get. Not at all to disparage Henry Shires and his wonderful designs (after all I have three of his shelters, use them more than any other shelters I have, and have privately talked at length with Henry about his designs), but since these shelters are going to used in the real world I think it is important to show what each of the shelters can and cannot do. There is no mention whatsoever on the TarpTent site about what kind of conditions the shelters were designed for. 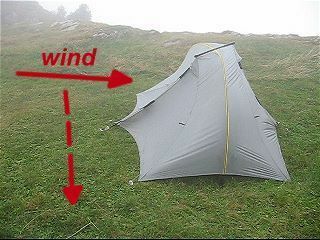 In fact there are several references to pitching the tents in “high velocity wind” (quotes from the info about the Rainbow: “In very heavy rain and high velocity wind-driven rain some extremely light interior misting is normal and equivalent to increased interior humidity.”; “Stake the corner pullouts if used without trekking poles or for extra stability in high winds.”; “Guy out back wall and front beak for stormy weather or privacy. Room for pack and/or wet gear under the beak.”), so it is natural to assume that the shelters can take a fair bit of beating. With all the talk on this site about weathering some rather nutty conditions with nothing but a tarp and bivy, I don’t think it is strange for people to wonder what popular shelters like the TarpTents can handle. After all, the whole philosophy of going ultralight hinges on the idea of pushing limits, no? Perhaps it is just as important to actually show the limits so people don’t put themselves in danger. Even though I’ve had two decades of experience in alpine conditions, I certainly wasn’t at all sure of the capabilities of my Rainbow until I actually took it up there and experienced the wind and rain first hand. Some of my doubts were completely dispelled, others very much reinforced. Like anything that is thought up, designed, and produced, there are always problems you will encounter. Nothing is perfect, especially when so little time has passed to allow the designs to mature. Henry is a great inventor, but even his ideas need critical analysis and refinement, and that can only come from people actually out there in the field using his ideas. I’m sure he’ll be the first to admit that. 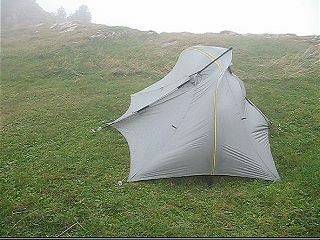 You are right, and I really hope my post did not come across as a criticism of you as a tarptent user. That was never my intention. I re-edited the last paragraph of my post above — esp. the last paragraph. Henry can correct me since he knows his tents… but IMO, tarptents are not designed to be used in places known for cold, strong winds or heavy snow fall. The longish tarptents all have unsupported sides that do not handle cross winds all that well. I believe the longitudinal pole of the Rainbows provide better wind resistance then the other models, but this is compromised to some extent by the Rainbow’s tall “wind wall” profile. 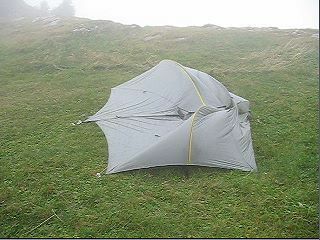 My main contention is that too many tarptent users jump at the chance to recommend their tarptents to anyone who asks… but are too often silent on mentioning any of the tradeoff’s. It would be far better to spell out both the advantages and the limitations of single wall tents and tarptents that are made of UL, non-breathable silnylon. Maybe tarptent makers and sellers will think about adding this to their websites. Yes, hiking pole support is a good idea. We can certainly provide grommets or loops at that point (on request anyway). Seems like a workable thing. There are always tradeoffs to any design and any cross strut will reduce lateral stability. I opted to put one in to dramatically increase headroom but also opted to keep it relatively short for better stability. Something like the Hubba Hubba design with a huge cross strut that extends out over the full width of the floor adds tons of headroom but is that much more unstable under lateral stress. As for the ridge pole loops, I think the dual “V” configuration (by that I mean staking to both sides of the arch as viewed from above) is probably best. You’re right that it wont stop the apex strut from moving but it will stabilize the arch and prevent collapse. Lowering the beak edges and staking them to the ground seams like a good idea but really reduces lateral wind resistance. It’s just much better to deploy the beak as shown on the website and let air flow through (under the beak) rather than trying to shut it off. I understand the natural desire to want to “batten down the hatches” but the DR wasn’t designed that way for high winds. The Cloudburst 2 beak is a 2-stake system and could certainly be moved into the RB/DR but then it just complicates setup (pushing the RB/DR into an 8-stake setup) and makes for extra staking that just isn’t needed for lower intensity conditions. I really wanted to keep the designs as simple and flexible as possible and, like everything else, tradeoffs are always involved. I’m happy to add extra staking points on request and will continue to work on incremental improvements. Great comments from all. I agree that our tarp-tent recommendations can sometimes be reflexively enthusiastic, without always providing the proper caveats. Miguel, have you heard any more specific data about the situation from Mr. Gunther? I’m wondering if he could make an educated guess on the wind speed, and perhaps describe a bit of the surrounding terrain in the area around the picture. What were his take-away lessons aside from the photos? Did the tent recover in more or less usable condition afterwards? Mark, Martin is a member of BPL and I cannot in good conscience speak too much for him. I think I may even have gone too far in making so many comments in conjuction with his photos to illustrate my own opinions about the Rainbow. He did tell me today that he would be making his own comments here, so I’ll leave it up to him to answer your questions. In the meantime, I do want to state that in spite of any criticisms of Henry’s creations it would be wrong to suggest that his shelters cannot be trusted. Henry goes out of his way to make sure he tests his designs thoroughly and always listens to customer concerns. When I had problems with my Squall 2 last year when it first came out, we had a very lengthy correspondence by e-mail about fixing the problems. I could never have done that with a big tent manufacturer like MSR or The North Face. So please take the critical comments here with a grain of salt. I will continue to use my TarpTents as much as ever! I used the DR on several alpine trips this summer in different parts of the Alps. I am really very pleased with the overall performance and I prefer this design to other popular 2-person tents like the Hilleberg Nallo 2. Nevertheless I had the feeling that additional loops for guy lines could increase stability in higher winds for more comfort and security. For this reason I decided to do a few tests during the first autumn storm this year. 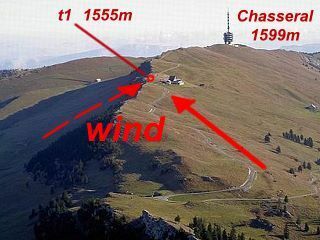 The recorded wind graph shows the strongest gust during each hour measured beside the Chasseral Swisscom antenna 1599m. During the video the wind blew with 7-9+bft, this means gusts up to 55+miles/h. I don’t think “a few more guy lines” would make much of a difference. The pole is whipped around by the wind. 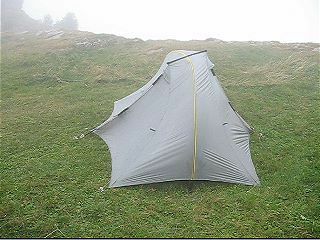 Then, there is the consideration of the tent’s very thin silnylon fabric! Actually, I do think more guylines would have made a big difference. Of course the structure would have flexed and twisted some but not to that extent. As I stated earlier, guying the beak halves directly to the ground reduces lateral stability. The guyline coming off the beak partway up is intended to provide lateral stability (and maintain the beak angle so it doesn’t present so much surface to the wind). But when you stake the beak halves it’s no longer useful. I haven’t wind tested the DR in 55 mph winds but just pushing on it it’s pretty apparent that the midway guyline provides more lateral support than staking the beak to the ground. So… a couple of attachment points with guyline tension directed away from the plane of the arch to increase lateral stability would help a lot. ESPECIALLY if you want/need to stake the beak to the ground. As for the fabric itself, I think it’s pretty apparent that it will take the stress. It’s very strong stuff and we just never see ripped fabric due to wind stress (and there was plenty for sure in this wind test). I was actually quite pleased to see the structure pop right back up after the gust subsided. Thanks Martin! Those are some great photos. Wow–55mph. Glad to hear this was an intentional stress test, and not a situation where you got stuck in a bad position unexpectedly. Very enlightening — Martin’s video and Henry’s insights. Thank you both! When I got my Rainbow from Henry back in February I had asked him to install four guyline tie outs as per that on the Hilleberg Akto. This summer in the Japan Alps I had occasion to test using the guylines during some pretty hairy conditions. The guylines make a HUGE difference, most especially longitudinally! So much so that I would almost say they should be standard on Rainbows. Still didn’t satisfactorily solve the lateral stability, though. As to fabric strength… silnylon was originally designed for parachutes, hence its other name, “parachute silk”. It is designed to take great wind forces and I wouldn’t hesitate to rely on it in some pretty strong wind. Certainly my experiences this summer proved it. When I got my first Squall three years ago I asked Henry then where he got his silnylon and he told me Aerodyne. I ordered some of the material myself and during the ordering process I spoke with the representative. She told of their silnylon’s need to be strong because people’s live’s depended on it. I’m not sure if Henry still uses Aerodyne, but you can be sure the fabric will take quite a lot. P.S. Also, I took out my homemade, silnylon pyramid tarp last night and tried it out in a real typhoon. No problems at all with the material… if it is pitched taut with little flapping. As Harry has already stated, and I have experienced (not with a TT), if the tent can “pop back up” when the gust subsides, and the fabric is still in one piece then this is indicative of a good tent IMHO. Watching the video indicates to me, that whilst it may be a challenging experience to be in the tent at the time, the message is that you will survive and as a consequence look for a more sheltered campsite the next night. My turn to “stir the pot” so to speak. 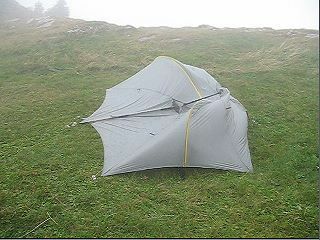 CAVEAT: IMO, the tarptents aren’t designed for regular use in alpine high wind situations. That’s not their market position. 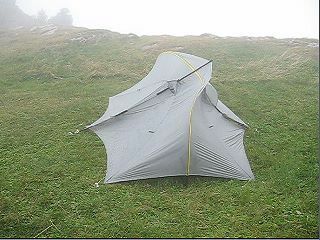 That said…..
Two guyout loops along the arch pole sleeve would help to stabilize the tent longitudinally. To add lateral stability, why not just open the velcro’d ends of the strut pole sleeve, take a bite around each, fold them back into position, and stake the other end of these lines to the corresponding vestibule stake, or to a second stake further out? Henry… I’m really sorry for this public raking of your design over the coals. I feel pretty bad about having started this. I know it’s important to look critically at our gear and try to improve it, but this whole thing has put you in the position of having to defend yourself. This is your bread and butter and here is not the place to get too critical over something the Rainbow wasn’t designed for. Can we all just admit that the Rainbow and Double Rainbow weren’t designed to be bomber tents and accept that there will be problems when they encounter alpine conditions? Though, as I mentioned to you before, it would be wonderful to get a Henry Shires’ version of an ultralight alpine tent! > Can we all just admit that the Rainbow and Double Rainbow weren’t designed to be bomber tents and accept that there will be problems when they encounter alpine conditions? I make alpine tents for snow conditions and high winds – multi-pole tunnels tents actually. I have to say I am boggled that the DR took that wind and survived. I also think it was asking WAY too much of the design! Fair go! Henry wrote that adding guy out points will make a big difference. He said nothing about the design/material being unsuitable. I still have my concerns, but once the guy lines are added, I WOULD LOVE TO SEE Martin do another test and video the result. Henry is right about the guylines. As I wrote earlier in this thread and in my gear review of the Rainbow, I used mine with the guylines all this spring and summer. They made a HUGE difference. well, that definitely looks like excessive conditions for a single wall silnylon structure to be in, especially set up in profile to the wind (55 mph gusts! ).